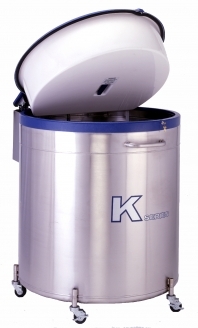 K Series cryogenic systems offer reliable LN2 storage with controllable temperatures between -100°C to -196°C. unique Temperature Gradient Suppression System greatly improves vapor phase temperature storage and recovery. 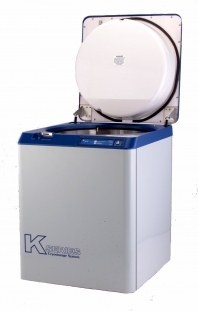 Every K model is backed by a 3 year warranty when purchased from L&G Cryogenics. The Taylor Wharton 3K LN2 System is the perfect cryogenic storage solution when you require storage capacities of up to 3,024 2ml vials. This unit features a wide neck opening for easy access to samples, a durable powder coated cabinet, and an all stainless steel vacuum vessel with superior performance. We offer a large variety of inventory systems and accessories making this unit complete. Durable powder coated cabinet Weight Empty: 42 lbs. Superior vacuum performance Weight Full: 125 lbs. The Taylor Wharton 10K LN2 System is the perfect cryogenic storage solution when you require storage capacities of up to 10,400 2ml vials. This unit features a wide neck opening for easy access to samples, a durable powder coated cabinet, and an all stainless steel vacuum vessel with superior performance. We offer a large variety of inventory systems and accessories including controls, making this unit complete. The Taylor Wharton 24K LN2 System is the perfect cryogenic storage solution when you require storage capacities of up to 24,050 2ml vials. This unit features a wide neck opening for easy access to samples, a durable powder coated cabinet, and an all stainless steel vacuum vessel with superior performance. We offer a large variety of inventory systems and accessories including controls, making this unit complete. The Taylor Wharton 38K LN2 System is the perfect cryogenic storage solution when you require storage capacities of up to 38,350 2ml vials. This unit features a wide neck opening for easy access to samples, a durable powder coated cabinet, and an all stainless steel vacuum vessel with superior performance. We offer a large variety of inventory systems and accessories including controls, making this unit complete.